Rail transport has been the backbone of American industry for generations, and what began as a disparate set of wooden-railed, horse-drawn tramroads is now an intricate, locomotive-powered freight system covering more than 150,000 miles across the country. As modern transportation and technology evolved in tandem, the business of freight transport evolved into a highly- structured and complex industry with significant maintenance, inspection and regulation requirements. Keeping America’s freight rail lines running efficiently, safely and securely is critical to our economy. It requires a highly skilled workforce equipped with reliable tools and technology to get the job done. Buckeye Mountain is a strategic technology advisor to the freight rail industry that helps them deploy technology solutions, including mobile technology. When tasked with making sure their customers had a highly reliable, easy to use and extremely durable technology solution to maintain the detailed records of rail car maintenance performed – as required by industry regulations (AAR) – Buckeye Mountain began investigating the different mobile device options. Today, over 10 years later, after making their decision to recommend Toughbook mobile solutions, Buckeye Mountain has grown to become a Panasonic certified Toughbook partner for the railroad industry. With Toughbook rugged mobile tablets and laptops, Buckeye Mountain has empowered their customers to evolve beyond manual record-keeping and invoicing and transitioned them to a mobile, digital record keeping solution facilitated by Toughbook rugged mobile devices built to withstand the extreme work conditions of railyards. By equipping customers with the industry leading rugged mobility solutions on the market, Buckeye Mountain has helped increase the railroads’ cost recovery for repairs made in the railyards, which was a considerable hindrance to regulatory compliance and profitability when invoicing was managed with pen-and-paper. Buckeye Mountain, which specializes in railroad technology including the development, deployment and management of hardware, software and wireless solutions, is a full service provider supporting their customers specifically in the area of rail car maintenance for over 20 years. Serving an elite group of customers including all of North America’s Class 1 railroads, Buckeye Mountain offers a wide breadth of solutions and is deeply involved in all aspects of supporting railroad mobile solutions. 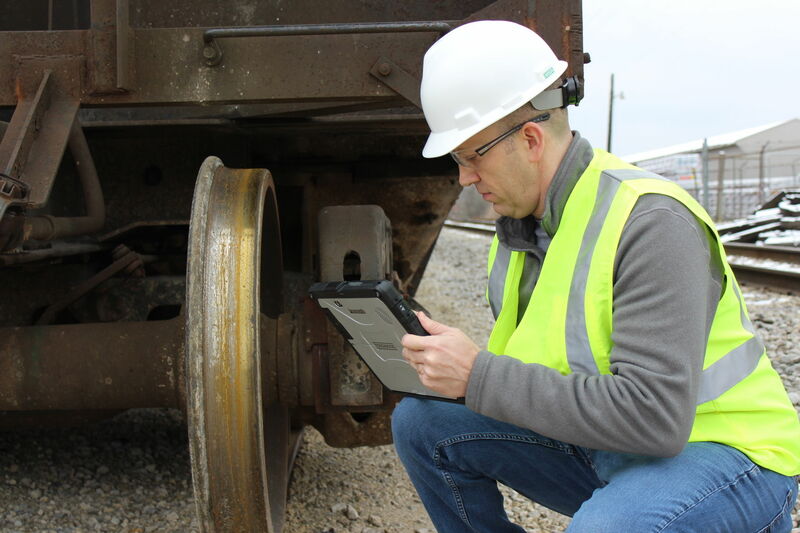 As a Panasonic Toughbook certified partner, Buckeye Mountain is able to deliver Toughbook rugged, mobile laptop and tablet solutions that fit the needs of those on the front lines of rail car repair and operations. With Toughbook mobility solutions, Buckeye Mountain has been able to help modernize their customers’ outdated pen-and-paper bookkeeping with a digital record-keeping and order processing system. Based on their deep industry experience, Buckeye Mountain knew standard mobile devices were not an option for the extreme conditions the rail technicians and crews faced. And because their customers looked to them to be a full service provider, including maintenance of the solution, Buckeye sought a technology provider focused on providing the right solutions and support for customers; not just an off the shelf, standard device. With Toughbook mobility solutions, Buckeye Mountain has been able to help modernize their customers’ outdated pen-and-paper bookkeeping with a digital record-keeping and order processing system. The railroad industry is required by AAR (American Association of Railroads) Industry Regulation to inspect and repair freight cars using shared rail lines and maintenance standards that are subject to a byzantine set of more than 3,000 job codes, which are regularly updated and revised. With mobility solutions from Panasonic, these rail car repair specialists are able to keep up-to-date with the rapidly evolving standards, but more importantly, Buckeye Mountain is able to transition customers away from the manually recorded invoicing process. Previously, due to outdated systems and device failure, Buckeye Mountain’s customers frequently lost sometimes over 50% of the repair billing records. With the use of Toughbook devices, they now have substantially better records and greater cost recovery for freight car repairs. For Buckeye Mountain’s customers, work location presents additional challenges. The railyards, where Buckeye Mountain’s customers perform inspections and repairs, are often located in areas where connectivity options are limited and high interference conditions exist. Because Panasonic builds customized antennas and modules to maximize the wireless performance, Toughbook devices offer exceptional wireless connectivity and a reliable data-entry platform to help ensure the rail crews work gets done, even in remote locations. Additionally, whether faced with a snow storm in Fargo or extreme heat in Phoenix, rail car repair technicians can count on Toughbook to withstand rugged conditions of all varieties. 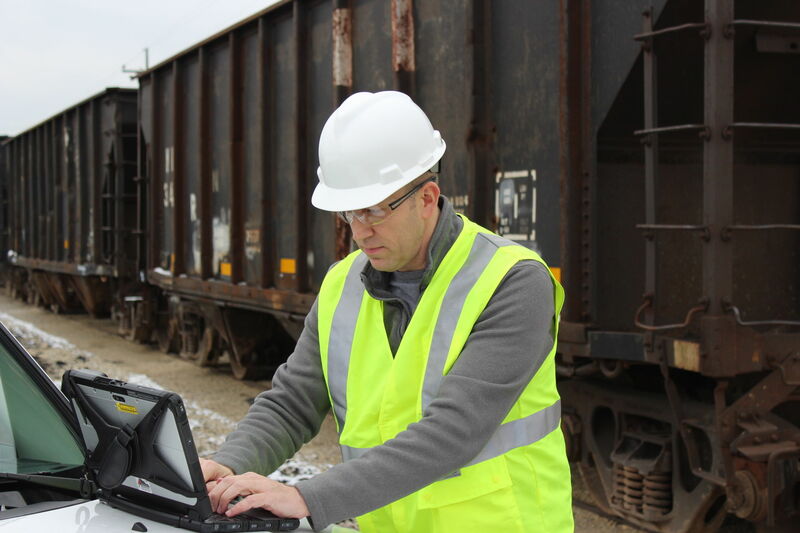 Toughbook devices offer exceptional wireless connectivity and a reliable data-entry platform to ensure the rail crews work gets done, even in remote locations. Buckeye Mountain’s partnership with Panasonic not only allows them to support their customers as a full service provider, but the unique relationship between Panasonic and Buckeye Mountain allows for a direct line of feedback to help improve the solutions Panasonic has become known for. Panasonic designs all mobile devices with the customer’s need in mind, and its relationships with partners like Buckeye Mountain allow that feedback loop to improve solutions for customers today as well as inform the next generation of rugged mobility.